When I first got seriously interested in beer, roughly ten years ago, Norway was a miserable place for a beer enthusiast. Norwegian beer was pretty much limited to four styles of lager from the industrials plus two half-decent brewpubs. As for imports, they were not very impressive, either. Two pubs had some Belgian beers, but that was about it. I used to memorize which pubs in Oslo had Erdinger, so I could get something decent to drink while out. At the same time, I watched enviously the way craft beer had taken off in the US and Denmark. In both countries you could buy interesting craft beer in just about any supermarket, some places even in gas stations, and the most interesting brewers were constantly coming up with new and exciting beers. By comparison, Norway didn't really have a beer scene at all, and it didn't seem like we ever would. Then, in 2003, Nøgne Ø started selling more interesting beers. Two years later, Haandbryggeriet started up. Norwegian beer was starting to get interesting. Then, all of a sudden, a number of interesting new breweries opened, one by one: Ægir (2007), Kinn (2009), Schouskjelleren (2010). Some of the industrials started brewing craft beer styles, too. Then Olympen opened (2007), and started taking beer seriously. It was quickly followed by Håndverkerstuene (2008). Then, in 2010, the wine monopoly opened two specialist stores in Bergen and Oslo, providing a regular supply of new and interesting craft beers in shops. So, in only a few years Norway went from being a beer desert to a really interesting place for beer enthusiasts. But is it really fair to say that the craft beer revolution has come to Norway? Are people really drinking these beers? Is the change really that major? To me it feels like it is, but let's see if we can find some numbers to support that feeling. 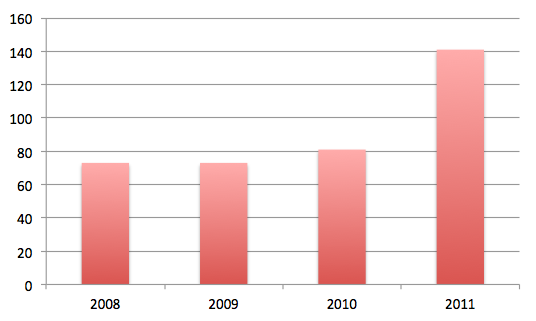 The Norwegian Brewery association publishes official statistics showing overall beer sales, and these show beer sales declining every year in the period 2008-2011. If we look at the breakdown of beer into categories we see all categories declining, except "strong beers" (above 4.75%), which show a 40% increase in the last 12 months. That's consistent with a real breakthrough for craft beer (which is mostly stronger than 4.75), but doesn't really prove anything. Sadly, the brewery association doesn't provide any statistics breaking beers sold into craft/industrial categories, so hints are all their data can provide. However, the wine monopoly (which runs the only shops that can sell these "strong beers") publishes detailed statistics of their sales. For the past five years their beer sales have increased at least 10% every year. However, most of the sales are strong export lagers and industrial Christmas beers, so this doesn't necessarily imply a craft beer boom. It could be strong industrial lager that's taking off. They also publish a list showing the sales for the most-selling 100 products within each category, including beer. Here we see that in the last year sales of Erdinger have increased by 12%, those of Nøgne Ø IPA by 100% (that's pretty amazing, by the way), and so on. However, this is just two of the 100 beers. What about the overall picture? As you can see, craft beer sales quadrupled in just four years from 2007 to 2011, going from 16% of total beer sales to 42%, or 109k liters to 450k liters. That seems pretty revolutionary to me. Let's look at the numbers of new Norwegian beers released each year as well. 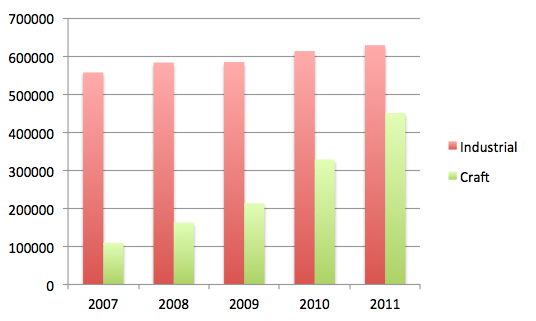 As you can see from the diagram below, the number of new beers has doubled in the four years since 2007 (from 73 to 141). That seems fairly revolutionary, too. If we look at the number of breweries we quickly see that that's changed quite radically, too. 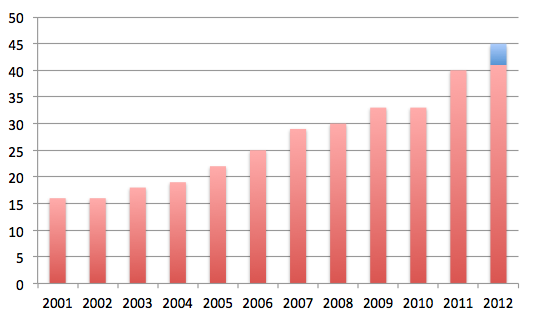 It's grown more slowly, but still more than doubled since 2003 (from 18 to 41). And while 2012 is not very old, we can already see that the trend is continuing. One new brewery has already opened, and at least four more have already announced that they are opening, so it seems likely that the total number of breweries will reach at least 45 this year. At this pace we'll catch up with Denmark measured by number of new beers per year (600-700) well before 2020. Craft beer revolution? You bet. Thanks a lot for doing the analysis. I am more prone to loose generalizations, cheers for you looking at the facts. And it was nice to see Sanel - the guy in the first photo - last night. There was a line for tables at Olympen restaurant, on a Wednesday in January. Their beer concept has shown the rest of the industry that a good beer list actually draws the crowd. Let's just hope Carlsberg doesn't notice. Great work, man! I shivered at the thought of moving to Oslo from San Diego, but not because of the cold. But it turns out I would be right in the middle of something big beer-wise. We need to start some sort of Norwegian Brewing website; not just a blog or a facebook, but somewhere people can come for definitive information. Feels like half the people I meet are just starting to dip their feet in the idea of craft beer. I had no idea there were over 40 breweries now! This is important information! Knut, you in? I know it's ambitious but I'm really thinking it's in order. Also I think starting a craft beer group in Oslo to can meet and taste once in a while is a must! Unless there already is one, in which case fabulous! How do I sign up? Lars, If you have the time you could email the top five micro breweries an ask for sales statistics for the last years. It could be an interesting follow up to this post. Michael, I don't think there is such group, no official one that is. If you want start one I'm in. Just find some kind of beer forum where we could announce it. Suggestions? Venner av n�gne � could kaybe need a localnchapter in oslo? Anywhere Norwegian craft beer enthusiasts gather, I guess? Maybe an email list? Facebook?